If you are looking for a really brilliant spring flowering shrub, then Crinodendron hookerianum could be it. Brilliant red waxy flowers that hang like lanterns beneath the foliage are the attraction. Although its is from Chile, it grows naturally in the temperate rainforest areas. It grows well in similar conditions to Lapageria rosea (Chilean Bellflower). If you live in a temperate climate, and have a cool shady position in tour garden it is well worth a try. The genus Crinodendron consists of a number of evergreen species of family ELAEOCARPACEAE, from Chile and Argentina. 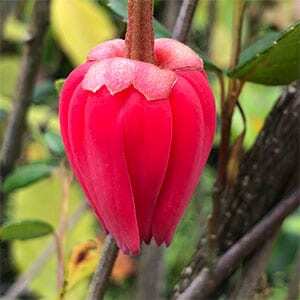 However it is Crinodendron hookerianum that is the best known and most widely grown in gardens. Along with C. patagua they are sought after as ornamental garden plants. These two species are of high ornamental value, C. hookeranum , with its scarlet pendant flowers is known as the Chilean lantern plant while C. patagua with its white flowers is known as the Lily of the Valley Tree. Both are cool to temperate climate plants reported to perform best under somewhat acidic soil conditions. They will reach a height of around 4 – 5m with a similar spread. Best grown in part shade in particular with protection from the hot afternoon sun. A humus rich moist soil is essential. Choose a sheltered position protected from hot sun and drying winds, good filtered light is best. Prepare the soil well by weeding and and digging in good amounts of compost and aged cow manure. Plant and water in with a liquid seaweed fertiliser. Mulch around the plant to maintain a cool moist root run. Water through ant hot dry periods from spring through summer. We can’t say that these are ‘easy’ plants to grow, however if you have a cool position in the garden, with a moist soil then you may be able to grow these wonderful plants with their attractive waxy flowers.